I’ve just returned from holiday, and a few days before that, I had my hair re-highlighted. With the prospect of 11 days worth of blistering Greek sun damaging and dulling down my hair colour I knew I needed the very best. 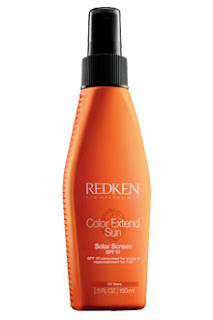 The Redken Colour Extend Sun was recommended to me, and it was fantastic! It’s not cheap but definitely worth it. Not only does it help protect your hair, but also your scalp from being sunburnt. As I have quite fine hair this was a massive bonus!! Used every day before sunbathing and throughout the day, my hair didn’t feel dry and knotty like it usually does from the sun, wind and chlorine. With a host of fancy ingredients Redken have come up trumps again with this new product. Now that I have my hair colour extended I need to focus getting my tan extended too! !